Bharat Sanchar Nigam Limited (BSNL) has announced the launch of Public WiFi Services and Unlimited Free Calling Offer during from its landline phones. 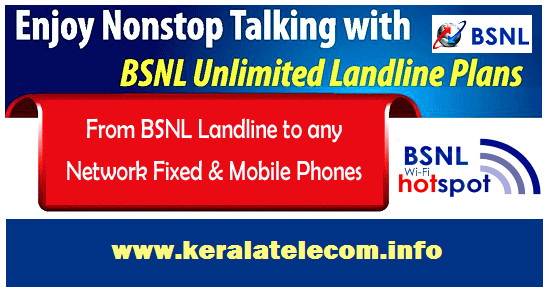 Unlimited Free night Calls are available from BSNL landline phones to all landline and mobile phones of all service provider networks on all India basis from 1st May 2015 onwards. The scheme for unlimited free night calls, from 9 p.m. to 7 a.m., was announced at a press conference by Chief General Manager of BSNL Kerala - Shri.M.S.S. Rao, on 28th April 2015. Under the scheme, all major landline general plans in rural and urban areas, landline special plans as well as all combo (landline + broadband) plans are covered. Shri. Rao also said that, BSNL is also planning to set up Public WiFi hotspots in 1,113 locations across Kerala Telecom circle. There will be 2731 Access Points where customers can access high speed wireless internet on their Mobile / Laptop / Tablet. BSNL will be installing WiFi Access Points in Public Places like - Shopping Malls, Railway Stations, Bus Stations, Airports etc. In Trivandrum, BSNL plans to install 135 WiFi Hotspots with 585 Access Points. BSNL awarded the contract to setup and operate Public WiFi Services to US based Quadgen Wireless Solutions Private Limited. “We admit there have been some issues with our services, but we have been able to address most of these in the past few months. There has been congestion of the networks, which we have solved by switching to a more powerful platform. We have also acquired more IP addresses. The issue of shortage of SIM cards has also been solved,” Shri. Rao added. Next generation switches (NGN) are also being deployed in phased manner in Kerala Circle. This technology will provide fixed line and broadband from the same telephone exchange. Dear readers, please share your views and opinions about these new attractive offers by BSNL via comments with us.